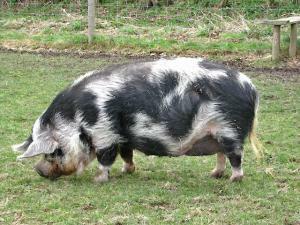 A courtesy car loaned from a car garage in Cambridgeshire has been written off after colliding with a 22-stone pig. Kevin Matthews, 17, was taken to hospital after the new driver crashed a loaned Vauxhall Corsa into the runaway pig in Warboys last week, the Cambridge News & Crier reported. Mr Matthews, who had only passed his test in February, was using the vehicle while his car was in a local garage for repairs. Strange incidents like this are a reminder that unforeseen accidents can happen at any time while you are out on the road. For a company or individual that has to drive vehicles as part of their motor trade business, making sure you have appropriate road risks insurance will ensure that, even in the unlikely event that a farmyard animal walks out in front of you, you will still be covered and thus will not lose out financially. Mr Matthews was found to have ligament damage in his wrist but no other serious injuries from the crash. The pig, however, was killed in the collision while the on-loan Corsa was written off. Recounting the incident, he said: “We were leaving Warboys and had gone three or four hundreds yards past the speed limit sign when we saw a car at the side of the road with its hazards on and there was a line of cars. Police and an ambulance quickly arrived at the scene to take the driver and his girlfriend to hospital.